My husband and I decided that we would make our cat a scratching post that we could put next to where he was scratching. 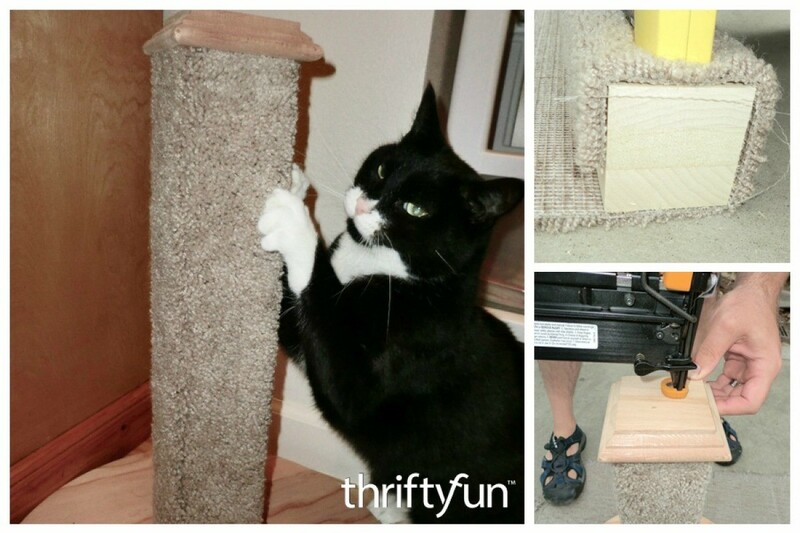 These cat scratching posts end up costing less than $10 to make. Cats get into and onto just about anything, so to prevent items from getting broken you have to either keep them out of reach, such as behind doors in a cabinet, or use a putty like Quake Hold that will keep the items in place. It is not all that different from when there are young children around the home, except they can get into more places. Cats are quite independent, and usually need love and attention, along with food, water and litter. But the larger bills are for vet care, as those are not spread out over the month. They are not high, and often just once a year is all that is needed, but it is usually costs up front. Typically, perhaps $100, and if you have to have the cat spayed or neutered, it will be a larger hit to your wallet. I am giving a link to an article on introducing a kitten into your home. There are suggestions, and a list of things to get. I ignore a bed, as they find a place, and I would get one of those inexpensive cardboard scratchers. Monthly care costs can usually be handled through a normal household budget. They are not large, but can vary. Some feed small cans of very expensive food, and others find a quality food that serves just as well at a much lower cost. And litter is not expensive. If monthly costs are a real concern, you may not be ready for a cat anyway.